It was last Sunday morning at 6:30 am. Eliana already had two eggs (and pizza) and she said she was still hungry. Elana’s Pantry to the rescue. As I’ve mentioned in a previous post, she and her site are my go-to. If this puts nutrient dense zucchini, eggs and coconut in her belly….. DONE. Crazy easy: these are the ingredients and the one-two steps. YUM IT UP! 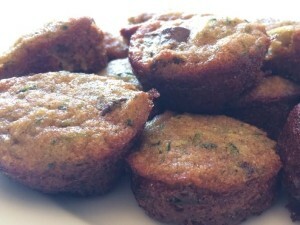 Paleo Gluten Free Zucchini Chocolate Chip Muffins TO THE RESCUE!